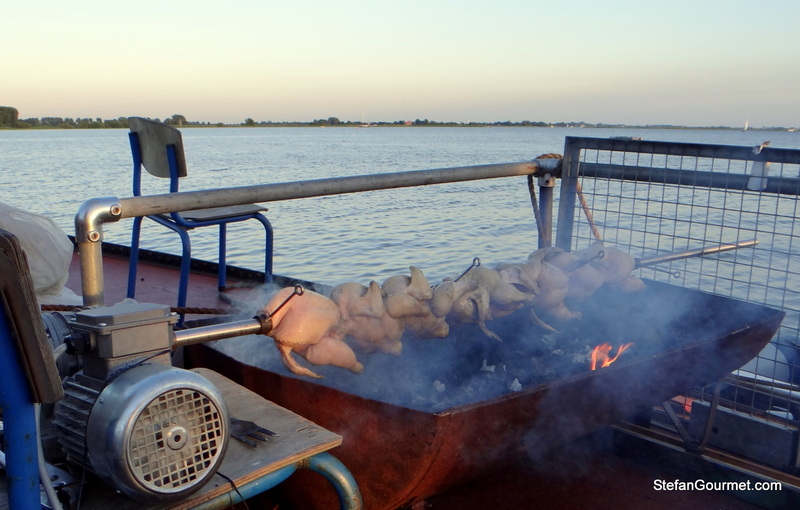 Another post from my cooking on a boat adventure. 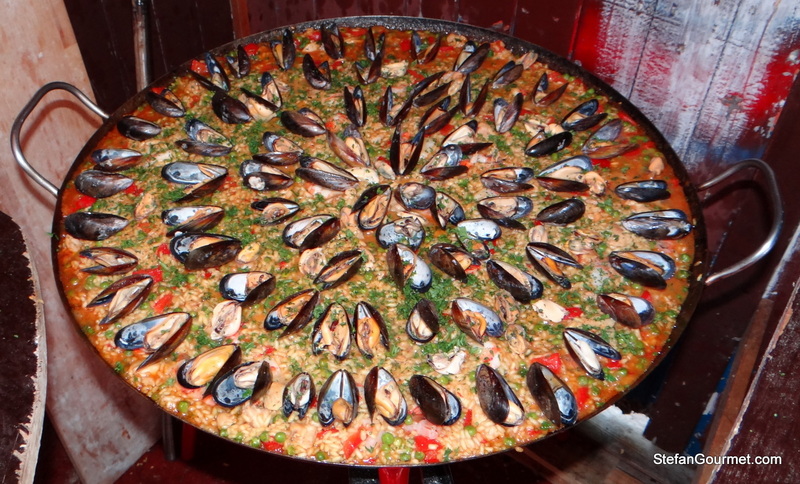 Paella is a great dish to cook for a large group, and I had borrowed a wonderful paella pan with dedicated burner. But what about stock? The stock is an important aspect of paella, which should be made from scratch rather than using bouillon cubes. Chicken stock and fish stock are obvious choices for paella, but where to get sufficient chicken or fish bones when on a boat trip? The answer I came up with is that on the evening prior to cooking the paella, we prepared rotisserie chicken. After eating them, all the bones were collected in a big pot and those were used to make a stock. We also made shrimp stock from the heads and shells of the jumbo shrimp used for the paella, and used the cooking liquid from the mussels. A good cook never throws away something that still has flavor in it that can be used! Since I’ve written about paella before, I will dedicate this post to the chicken. However, first some more pictures from the boat trip. 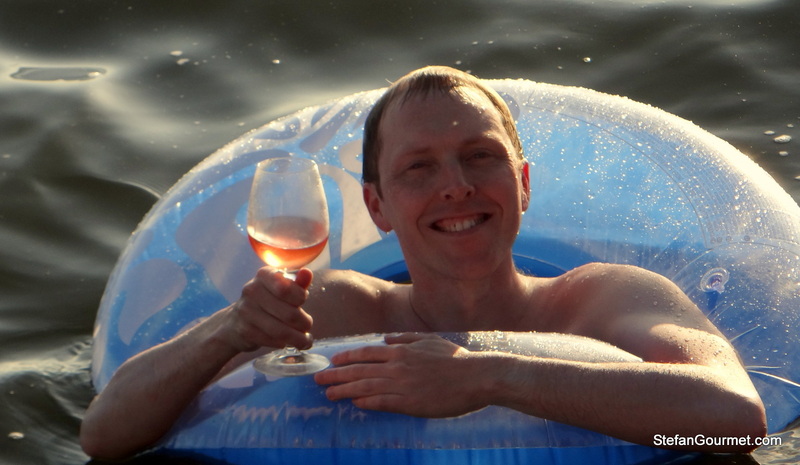 Large quantities of beer are consumed on board, but I brought my own stash of wine — a different bottle for each day, paired with the food obviously 😉 — and like to cool off in one of the lakes with a nice glass of white wine. 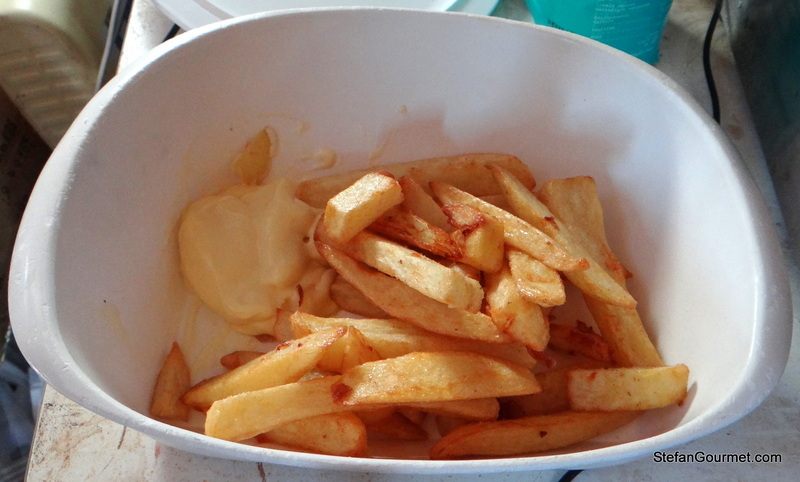 To go with the chicken, we prepared hand-cut fries, deep fried in beef tallow. As fans of Pulp Fiction know, we eat our fries with mayo. 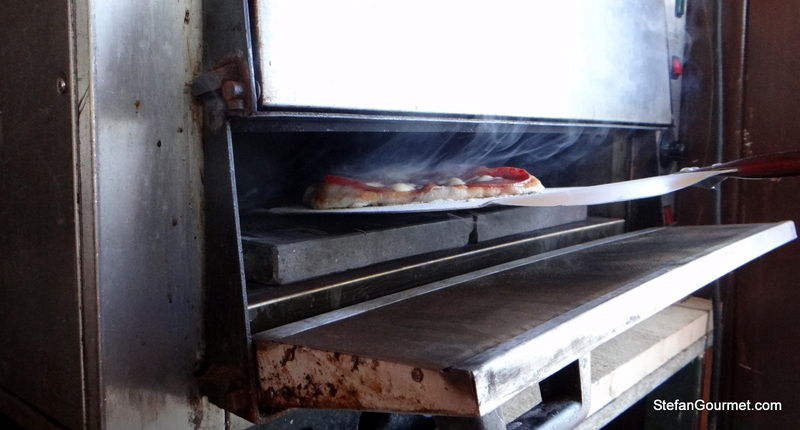 Thanks to the amazing oven we had on board, we could cook Pizzeria-quality pizzas in under 2 minutes at 450C/850F. We had our own little pizza production line and made 25 pizzas in little more than an hour. It goes without saying that I also brought my sous-vide cooker on board. We prepared warm-aged sous-vide rib steak that was finished on the grill/BBQ. 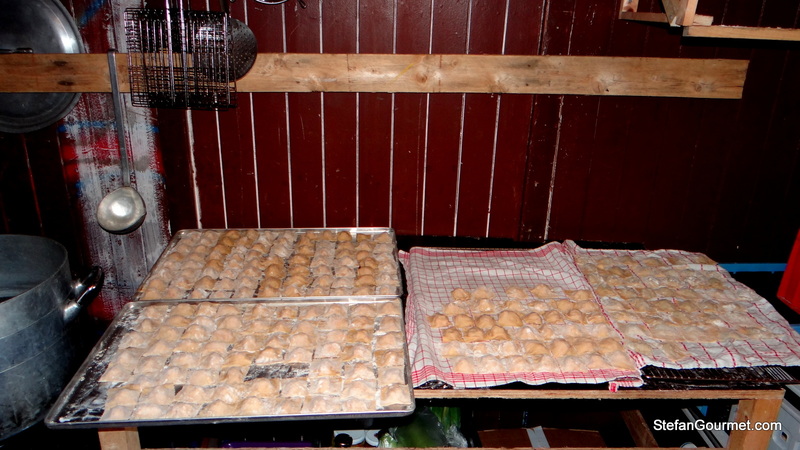 Another production line was ravioli made from scratch. For the rotisserie chicken I prepared the same basic brine as for the spit roasted suckling pig. 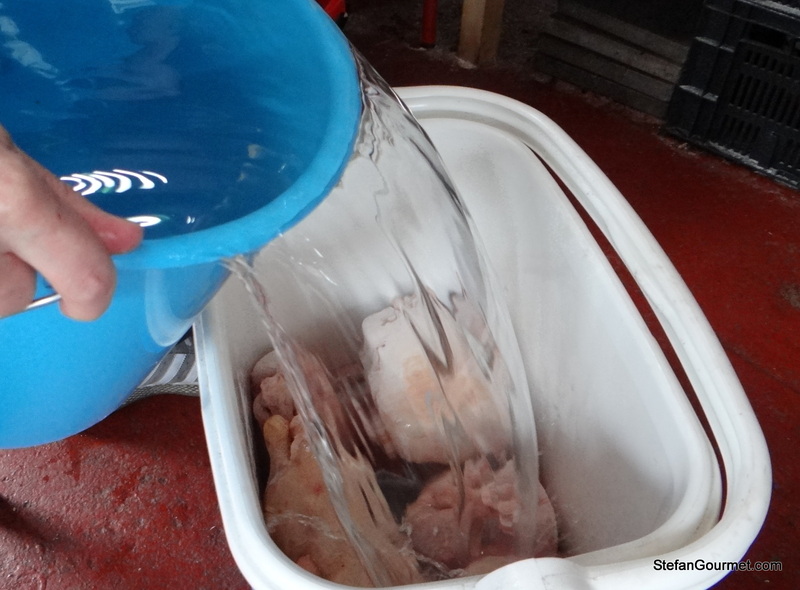 For 13 chickens of 1.2 kilograms each I used 18 litres of water. The total weight of water and chicken is therefore 13 * 1.2 + 18 = 33.6 kg. To obtain a 1% salt concentration, I added 336 grams of salt to the water. 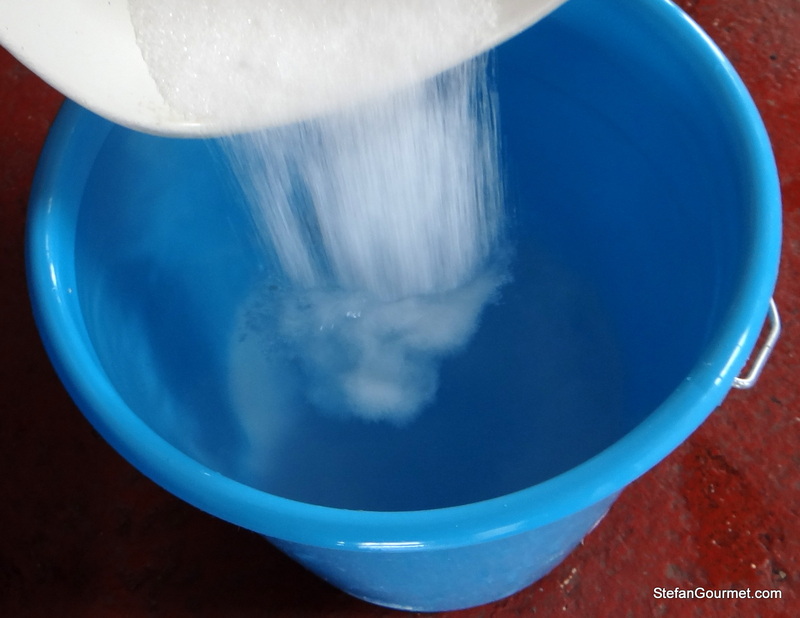 I also added 134 grams (0.4%) of sugar. I put the frozen chickens in a beer cooler and added the brine. I closed the beer cooler, allowing the chickens to thaw and brine at the same time. I monitored the temperature, which should not become higher than 5C/40F. 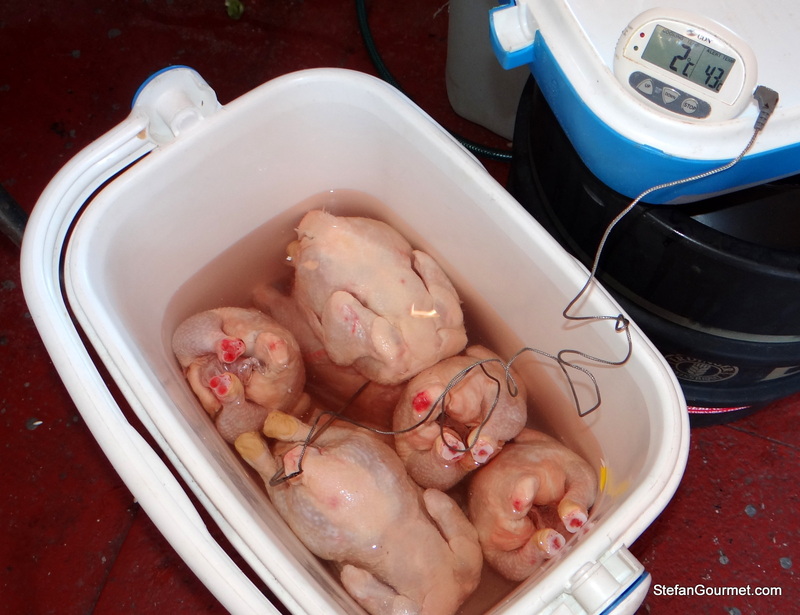 After 24 hours the chickens were thawed and brined. The chickens were roasted on the same improvised rotisserie as the suckling pig. They were basted with olive oil after half an hour and they were roasted until the breast was at least 60C/140F and the legs at least 65C/150F. Afterwards the chicken bones with some leftover chicken meat attached were used to make a stock for the paella. 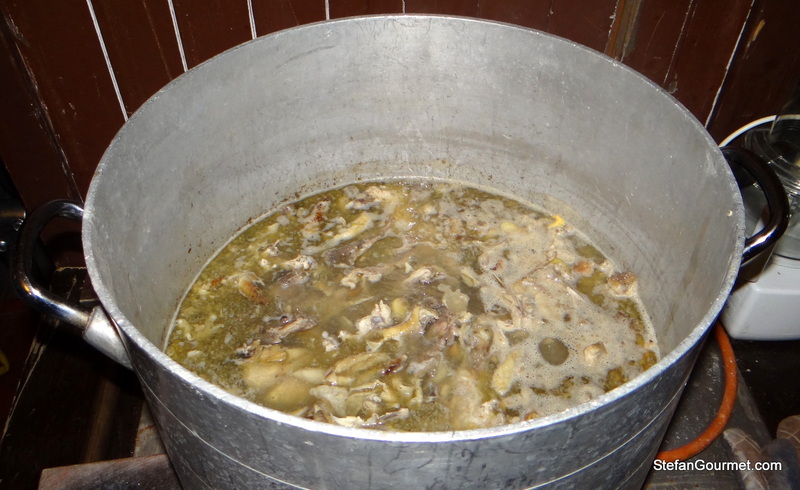 As the bones are boiled, there is no health concerns about making stock this way. The paella turned out great! Another master piece Stefan! Good use of the leftover stuffs. I don’t know if I’m more envious of the cooking or of the eating! Stefan, I am in awe! Love to visit your blog and get to see your culinary world! Look at you, you are happy and content! That’s the life! Lovely stuff Stefan. I admire the big production cooking. Very good indeed. I love hand-cut fries served with a large dollop of mayonnaise on top. I like the mayonnaise that they serve in Amsterdam because it is slightly sweeter, has a tad of tang, and is creamier in texture. I find store-bought American mayonnaise bland and oily and it doesn’t sit well on my tongue. I agree. Stefan we need you to show us how to make mayonnaise ‘a la Amsterdam’ it is different and better. Paella is one of my favorites. Great to know your boat trip is so much fun. Enjoy! 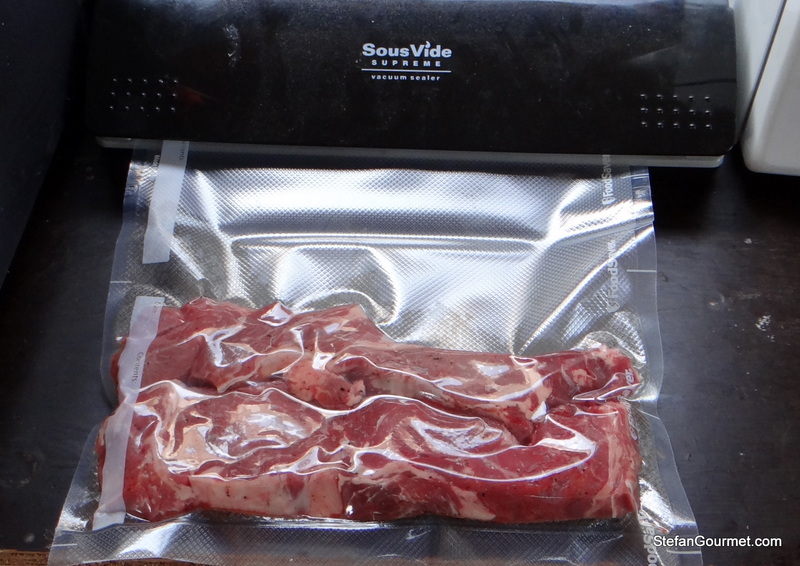 Portable sous-vide. Is there anything you can’t do with that thing?